Earlier in October I spoke about meeting Jason Mraz, for the first time, at a JFK center event in Washington, DC. I was excited to meet the incredibly successful & talented singer that isn’t too cool to sing a Mister Rogers song at his concerts. But to completely push me over the (happy) edge, he was interested in recording the opening and closing songs of Daniel Tiger’s Neighborhood for us. Sitting on the “this might happen” info for months was painful but we finally got word that, although Jason was on tour, he was able to squeeze in some studio time, to record the tracks for US. While this info didn’t leak until a few months ago, I am so proud to announce that today, on this day o’ LOVE, Jason Mraz has taken us in and out of Daniel Tiger’s Neighborhood by way of what he does best. I can not thank Mr. Mraz & his team of professionals enough. Enjoy & let me know what you think of the new version! 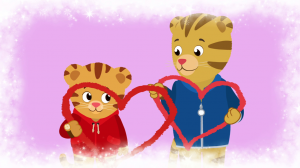 Also, be sure to check out the beautiful post that Marshall Heyman, of the Wall Street Journal’s Culture section, wrote about Mraz’s involvement for today’s episode, entitled Mr. Rogers’ Classics & Tiger Love. But did Jason Mraz really “record them wearing a cardigan“? ..as well as Jason’s mention, on his blog, about the impact that Fred Rogers had on him. Hold that thought–one half of the episode has appeared on the website, so my question has been answered! So you get to have your cake & eat it too, so to speak.. I only bring it up because you asked. Hi Angela. Let me just say Daniel Tiger is a HUGE hit in my house, especially with my two year old. We love this show and sing the songs all day. I love that when a problem arises, we can sing a Daniel Tiger song and it helps us get through it! Amazing! I do want to say that the music is one reason why we love this show so much, but what happened to the original singer of the theme song? I noticed in the new nature show that it’s different. We LOVED the original voice. Thank you Angela for creating this show!